Let's take a minute and get a group photo, last of the summer! 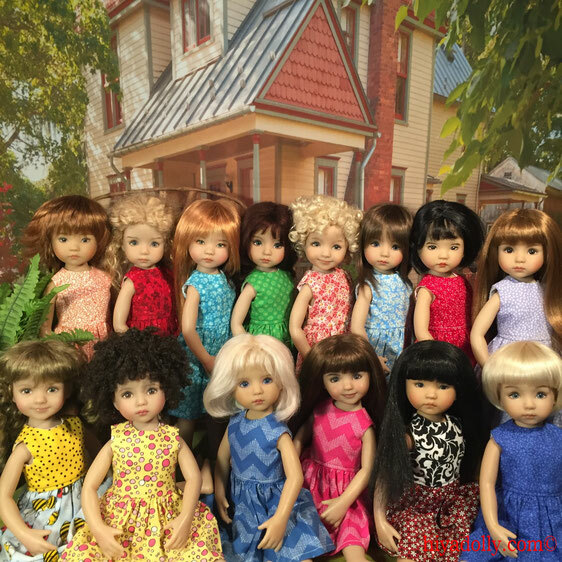 Here are all the Little Darlings who live in Dolltown. They are all important to our stories and we love each of them! We have two by Dianna Effner herself, several more from three other artists: Geri Uribe, Helen Skinner, and Joyce Matthews. And our UFDC Ana, a convention doll. Each girl has a BFF, but they mix it up a lot. Like Lula and Faith , with their synchronized swimming routine! These girls never go in real sunlight, but they do climb trees, trail their hands in creeks, and have messy ice cream parties, requiring wipe downs and hair washes! We don't have a cabinet big enough, so they live on shelves or in baskets nearby us, where they carry on their socializing and planning their next adventures. Now, let's get back to that lost baby! Oh, how I LOVE this photo..... I can see why you fell in love with them and why the "family" is this large. Oh, I will have to bookmark this page and return when I want an instant smile!!!!!!! I love them for sure. And each really does have a story of how she came to Dolltown. The first choice was a big commitment that I had NEVER considered, when I ordered four at once, and the Dolltown stories began in my head! It made me a little dizzy that day and I have been a little dizzy ever since!